Description: We provide the best wood quality products and high quality plating grade steel for metal products. From the raw parts to the finished product, our utmost attention is focused on detail to ensure that our products will be the best for our users. Our metal stools have an oven baked powder coat finish that is extremely durable and long lasting. This Louisville TV Cover by HBS is hand-made in the USA using the finest commercial grade vinyl and utilizing a step-by-step screen print process to give you the most detailed logo possible. UV resistant inks are used to ensure exceptional durability to direct sun exposure. Spandex-like material wraps around the back of the TV, keeping moisture out while allowing heat out and helping to prevent overheating. Back opening allows a fit on any wall mount, and bungee allows cover to be cinched down securely. Cover also contains a pocket for remote control storage. This product is Officially Licensed, so you can show your pride while protecting your TV from the elements of nature. Keep your TV protected and support your team with the help of Covers by HBS! 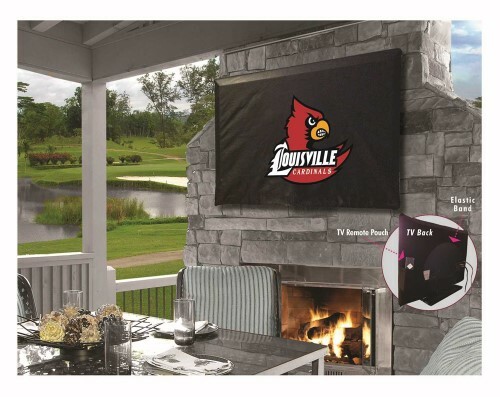 Features Made with Commercial Grade Vinyl Draw String Bottom Breathable Vinyl to Fight Against Mold UV Resistant Inks Specifications Color: Black Material: Vinyl League Name: NCAA Upholstery: Faux Leather Fits TV Size: 50" to 56" Team Name: University of Louisville Dimension: 1" H x 31" W x 55" D Weight: 2 lbs. We provide the best wood quality products and high quality plating grade steel for metal products. From the raw parts to the finished product, our utmost attention is focused on detail to ensure that our products will be the best for our users. Our metal stools have an oven baked powder coat finish that is extremely durable and long lasting. This Louisville TV Cover by HBS is hand-made in the USA using the finest commercial grade vinyl and utilizing a step-by-step screen print process to give you the most detailed logo possible. UV resistant inks are used to ensure exceptional durability to direct sun exposure. Spandex-like material wraps around the back of the TV, keeping moisture out while allowing heat out and helping to prevent overheating. Back opening allows a fit on any wall mount, and bungee allows cover to be cinched down securely. Cover also contains a pocket for remote control storage. This product is Officially Licensed, so you can show your pride while protecting your TV from the elements of nature. Keep your TV protected and support your team with the help of Covers by HBS! Features Made with Commercial Grade Vinyl Draw String Bottom Breathable Vinyl to Fight Against Mold UV Resistant Inks Specifications Color: Black Material: Vinyl League Name: NCAA Upholstery: Faux Leather Fits TV Size: 50" to 56" Team Name: University of Louisville Dimension: 1" H x 31" W x 55" D Weight: 2 lbs. Enter the details of an online store that carries UPC 071235441982 below. The store's URL must go to a valid product page that has the product displayed with pricing information.